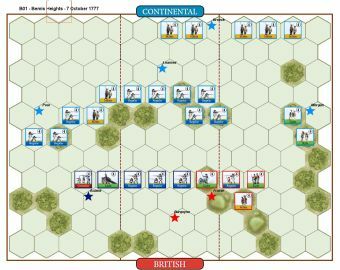 Major General Nathanael Green, commander of the Continental army in South Carolina, divided his forces sending Brigadier General Daniel Morgan to attack the British backcountry fort, Ninety-Six. 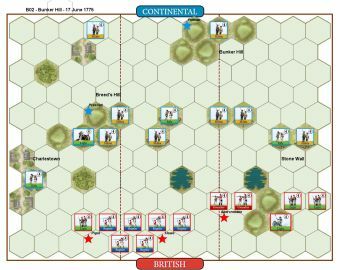 Cornwallis dispatched Banastre Tarleton to catch the Continental forces. 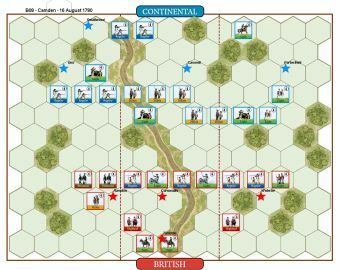 Morgan prepared for the encounter with Tarleton by backing his men up to a river at Cowpens just north of Ninety-Six. As Tarleton’s men attacked, Morgan instructed the militia to skirmish with them, but to leave the front line after firing two rounds. 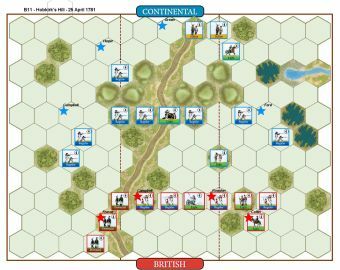 The British mistook the repositioning of the Continental militia as a rout and ran into concentrated fire from Morgan’s third line, on the hill, which was manned by his best troops. 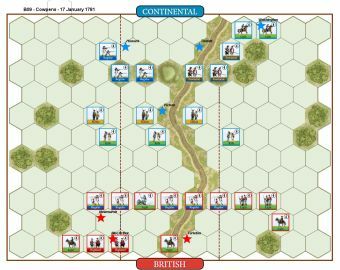 This unexpected volley coupled with a cavalry charge proved too much for the British and nearly half of the British and Loyalist infantrymen surrendered. 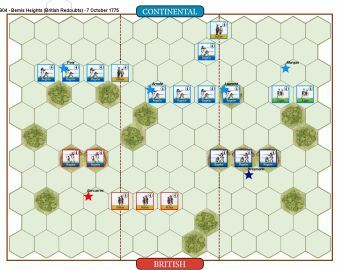 Tarleton escaped, but Morgan’s troops had decimated his attacking force. • Opening Cannonade rules are in effect. Continental Rifle units will participate in the Opening Cannonade and may fire and retire prior to the start of the battle. 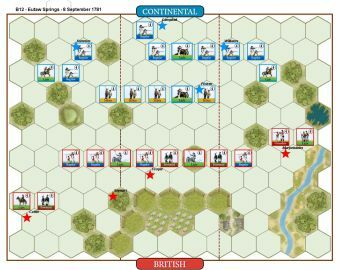 • The Continental player gains 1 Permanent Victory Banner for each Scout Command card he plays. A 7-4 win to the British. 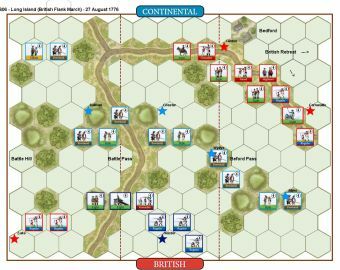 The first 2 rounds of British fire saw two American Rifles and a Militia unit each take a hit and then rout from the field. 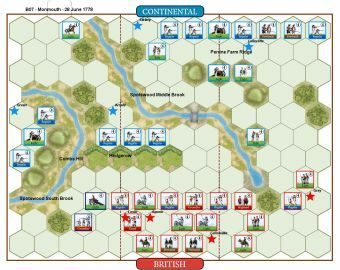 The Americans were taking sustained damage but then played two Rally cards in succession and put most of their damaged units on their right flank back to full strength and the British turn to suffer with 2 Regular units and a Highland unit being shot to pieces and routing. 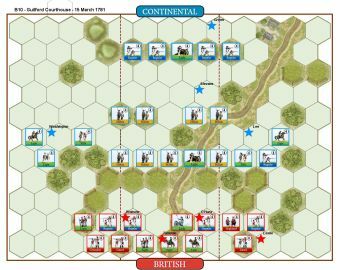 The British right and centre advanced and delivered two Line Volleys which left the American centre and left reeling with a Provincial unit and General Triolett fleeing the field. 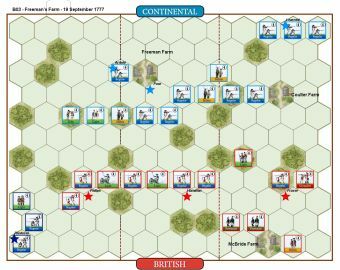 A bayonet attack from the British Lights and some Regulars decimated the damaged American centre and broke multiple units plus General Picken. 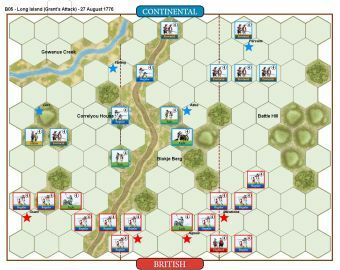 Historically, this American army had its back to a river so on this result history was reversed and the Americans would have been destroyed and Tarleton regarded as a hero. A well balanced scenario and the game mechanisms played out very well.